*Well one of them anyway. 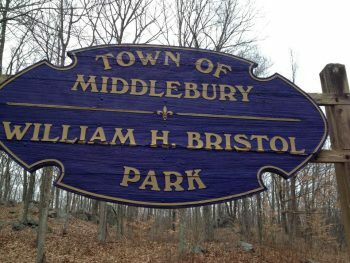 And I think I can say this is the oldest in Connecticut, but that doesn’t have the panache. “Ellington is home to one of America’s oldest roadside memorials.” This is from the impeccable source called Wikipedia – which doesn’t source it. I can’t even find it anywhere other than ancillary Ellington pages. I’m guessing someone from Ellington’s historical society wrote the Wiki page and, well, Truthiness! 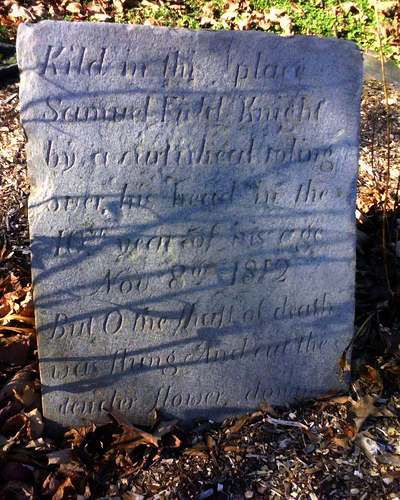 I think we can agree that any surviving roadside memorials older than this one (1812) will be few and far between. And, let’s be clear – everything I see says “one of the oldest” which is fine. I’m the only jerk claiming oldest. I learned about this gem from my friend Dave at Dave’s Cupboard. So there is no point in me pretending I have anything original here, so let’s just turn to Dave. In fact, this picture is from him too, because mine picture was terrible. >The marker is a piece of grey stone – granite maybe? – a little bit smaller than the typical headstones of the period, set in the center of a circle of fieldstones. Gravel keeps down the weeds around the stone, but that’s a modern improvement. 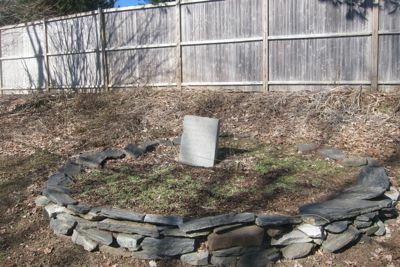 For many years the marker had been forgotten, overgrown with brush, and was “rediscovered” several years ago and cleaned up. Curiously, if you don’t realize how many farms are in Ellington/Enfield/East Windsor, take a look at this – There are roads (Rye St in South Windsor) in this area that are transporting. Afterwards, we went up to Kloter Farms and sat in a giant chair.